Are Virtual Desktops More Secure? Everyone says to virtualize your desktops and you will be more secure, but is that really the case, we will look into the concept around 'more secure' with why this could be and most likely is not the case. Can it be more secure, perhaps, is it? The reality is a bit less than people realize and could open the door to more risk. Edward Haletky provides Virtualization, Virtualization Security, Network Security, Secure Coding Consulting and Courseware as well as Linux Security and Application Development. * Author of "VMware Virtual Infrastructure Security: Securing the Virtual Environment" and "VMWare ESX Server in the Enterprise: Planning and Securing Virtualization Servers", published December 2007, Copyright 2008 Pearson Education. * Guru and moderator for and participant in the VMware Community Forums. * Moderator for the Virtualization Security Podcast held every other week on thursday. * Analyst and Managing Director for The Virtualization Practice, LLC. * Participant in the VMware VMTN Communities Roundtable Podcast held every wednesday. * Blogs about Virtualization on his own Blog, Blue Gears, as well as for the Virtualization Practice and TechTarget. * Writer for various online and physical magazines. 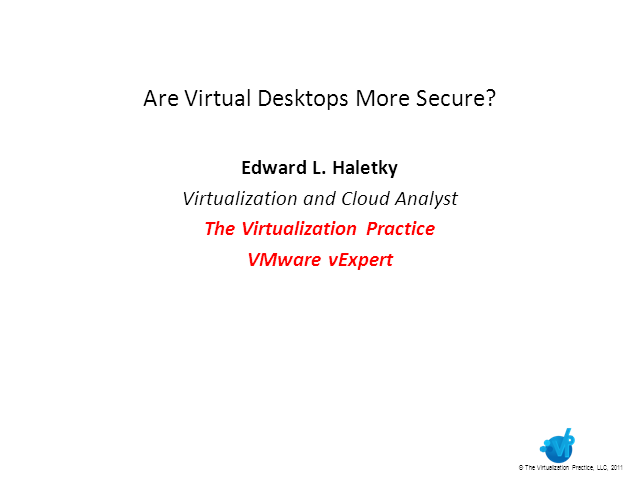 Title: Are Virtual Desktops More Secure?